After a little stumble out of the gate during the previous week because of some tech issues we had to resolve, my Media 21 students jumped full force into adding content about their new veterans’ issues research project to their Netvibes information portals this past Monday. While I am doing some “Netvibes triage” for students who may feel a little less confident even after some guided group practice and the sharing of video tutorials, some students have jumped in fearlessly and become our classroom experts who are exceeding our expectations and helping their peers, too. 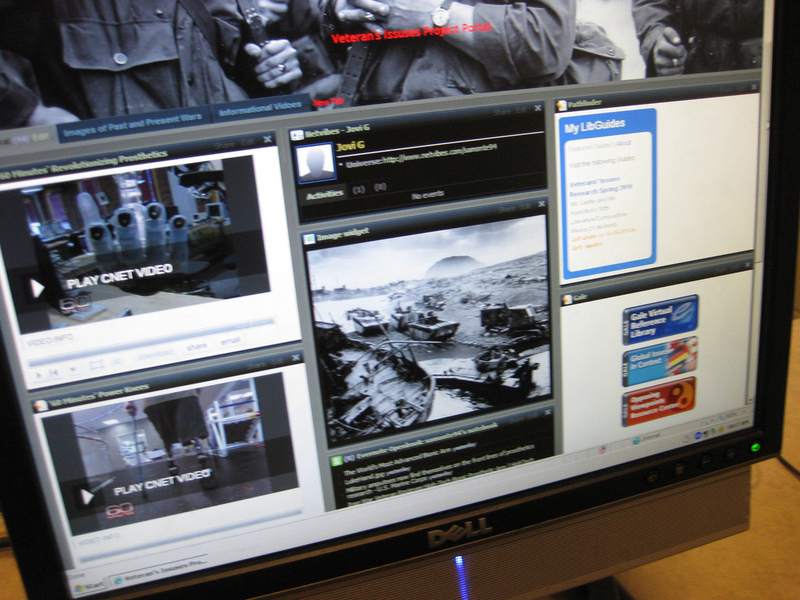 Originally, Ms. Lester and I envisioned the Netvibes portal as being a PLE (personal learning environment) that would reflect the tools and information sources for their research on the veterans’ issues each student selected. However, as you will see in the videos, some are also using Netvibes to create additional tabs to house information sources and multimedia they feel supports the books they are reading in their literature circles that are taking place concurrently within the larger context of this research project. The videos you are about to see were shot on the fly during 7th period on Friday, March 26, 2010 in class. When asked if they needed a moment to collect their thoughts about what they wanted to share in the video, neither student hesitated and was immediately ready to tell the story of their work with Netvibes from the last week. The videos are a wonderful form of assessment in terms of students sharing their work as well as providing feedback about how certain tools or learning activities are (or are not) working for them—I love my Flip cameras! Above all, though, these videos make me realize how much these students have grown since August—I honestly sat in awe as I listened to them articulate their work they have accomplished in just a few days and to hear the passion in their voices about their research topics and work. You can visit these students’ Netvibes pages (which will still be growing until the beginning of May) by clicking here and then clicking here. My next post will share students’ responses to Evernote, so please stay tuned! I absolutely love these videos. I wish research had been like this when I was in high school. I love how these videos help you understand more about your students, their thoughts on the project, and their knowledge of the tools that they have used. I’m also so grateful for your willingness to share these with everyone so that we can learn from your students as well. Wow, wow, wow! Great to see what wonderful work the kids are doing with Netvibes. And what a terrific project you and Ms. Lester have here. A great model for other schools. Now I’m going to sign in to my Netvibes account and see if I can add some of those handy search boxes that Alex has on her page. Thanks for sharing this with us! I love the way your students can talk about the decisions they are making in organizing their digital world. Also, thanks for being such a great example for future librarians such as myself.